Jackie O and I have been together since she was 8 weeks old. 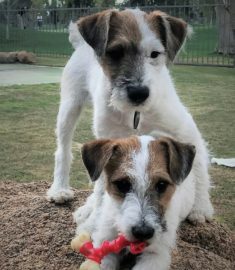 My wife and I bought two dogs at the same time; A mixed breed Jack Russell Terrier, Jackie O, for my wife, and a German Wirehair Pointer for me to hunt with. Within a week, Jackie O was following me everywhere and wanted nothing to do with my wife, so we traded dogs. Since then Jackie O and I have been a great team. She goes to work with me, sleeps with me, eats with me, and goes everywhere I go. Jackie O is well known at the office and all of my favorite stores and restaurants. I own a theatre in the round that seats 2,600 people for concerts like Willie Nelson, Franki Valli and all types of acts. As the owner I welcome the people and introduce the artists. About ten years ago I started to take Jackie O on stage with me. The people loved it and so did she! At fifteen years old, Jackie O has reached retirement age. About a year ago I started contemplating what I would ever do without her. That’s when I heard about cloning and starting looking into it. Since Jackie O is a mixed breed I couldn’t just go out and buy another dog like her. I found ViaGen Pets online and I decided to clone her because I’m a wild and crazy entrepreneur who likes exciting new challenges. What a surprise to learn not only did I get another Jackie, but I got Twins Baby Girls that are Genetic Twins to Jackie O. Wow! Who goes on stage now? Having Jennie O and Jillie O meet Jackie O was very fun! I’m already seeing some of Jackie O’s traits in them and I’m looking forward to many interesting years with them.